One year later, the offense is a whole lot different. Following Lazor’s new script — and an overhauled offensive line — the Bengals are 2-0 with their 34-23 win over AFC North rival Baltimore on Thursday night. 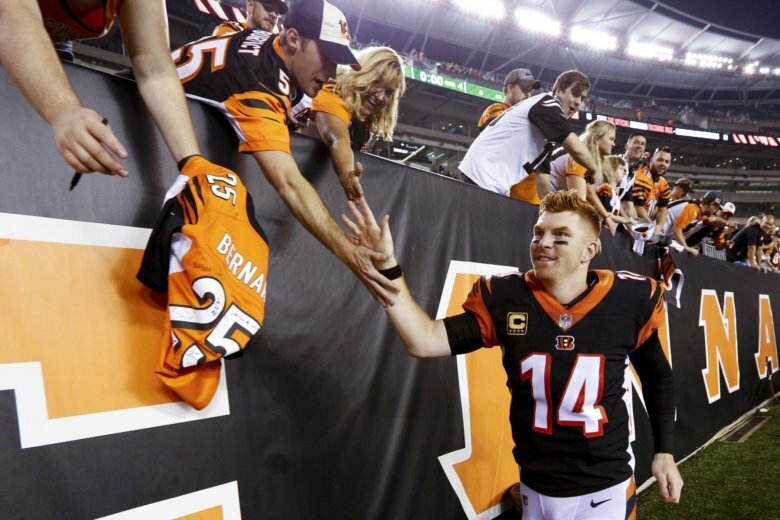 Andy Dalton threw four touchdown passes, and the Bengals became the first team to score at least 34 points in their first two games since the 2013 Broncos, according to ESPN Stats & Info. “I’m loving it, and I’m sure everyone else is loving it,” said Tyler Boyd, who had a 14-yard touchdown catch . Especially after the last two seasons. Lazor was elevated from interim coordinator and spent the offseason rewriting the playbook. In the first two games, he’s leaned more heavily on running back Joe Mixon both as a runner and receiver. He’s moved Dalton out of the pocket on misdirection plays. And he’s put the emphasis on going for big plays, something that was missing last year. Dalton has looked very comfortable in the new schemes. He’s completed 64 percent of his throws with six touchdowns, one interception, two sacks and a passer rating of 108.5. Lazor’s approach allows him to do what he does best: get rid of the ball quickly in a fast-paced, West Coast offense. “Those two games defined us as a team,” said receiver A.J. Green, who had a career-high three touchdown catches on Thursday, all in the first half. Some players think the 2-0 start could come to define this year’s team. The Bengals are 2-0 for only the fifth time in Lewis’ 16 seasons. The last time was 2015, when they won the division title and suffered a first-round playoff meltdown against Pittsburgh at Paul Brown Stadium. Mixon hurt his right knee in the first quarter Thursday and was in and out of the game, finishing with 84 yards rushing and one catch for 3 yards. Mixon said the knee felt “weird” and was sore, but he decided to return to the game. He was getting an exam to assess the problem.